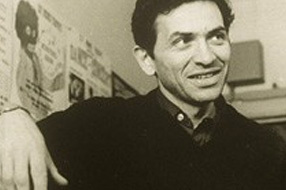 Bill Graham was born Wolodia “Wolfgang” Grajonca in Berlin, Germany. During World War II, with his father dead, the Nazi pogrom underway, and his mother gassed to death on a train to the Auschwitz concentration camp, Grajonca fortunately became part of a group of children that the International Red Cross enabled to ultimately escape to the United States where he was placed in an upstate New York army barracks. Later, a Bronx family brought him to live with them. Though not a citizen, he was drafted into the army and served meritoriously in the Korean War. Graham’s first experiences with entertainment came when he worked in various New York Catskill resorts, such as Grossinger’s (Liberty), the Concord Hotel (Kiamesha Lake) and the President Hotel (Swan Lake). In the mid-1960’s, Graham was drawn to concert promotion while business manager for the San Francisco Mime Troupe, a radical theater group. [November 1, 1965: Graham presented his first show, a benefit for the San Francisco Mime Troupe.] 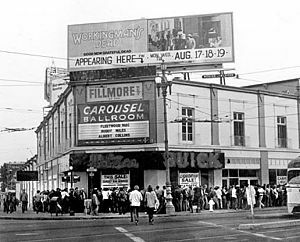 Graham eventually found success promoting and presenting such bands as the Jefferson Airplane, the Paul Butterfield Blues Band, and famously the Grateful Dead at the Fillmore Auditorium (between 1966 and 1968) and later at the Fillmore West (beginning July, 1968). Bill Graham opened the Fillmore East on March 8, 1968 with blues guitarist Albert King, folk singer-songwriter Tim Buckley, and Big Brother and the Holding Company. The hall’s characteristic schedule was a two-show, triple-bill concert several nights a week. Graham would regularly alternate acts between his east and west coast venues. Until early 1971, bands were booked on both Friday and Saturday nights to play two shows per night at 8 pm and 11 pm, which might end at 3 AM or later. Complimenting FM radio stations (like WNEW-FM in NYC) then recent forays into progressive rock formats whose DJs exposed rock music lovers to so-called underground bands with their extended improvisational jams, the Fillmore East fed the growing appetite for live music venues and presented those bands as well as introducing upcoming groups such as Santana and Sly and the Family Stone. 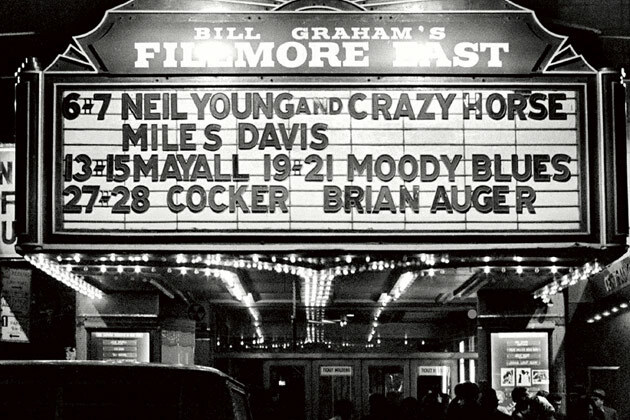 Bill Graham made the Fillmore a safe haven where kids could experience the music they wanted without getting busted. 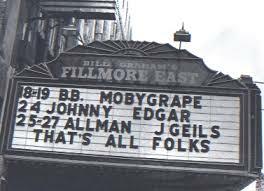 As he wrote in a letter published in the Village Voice just before the Fillmore’s closing: it was my sole intention to do nothing more, or less, than present the finest contemporary artists in this country, on the best stages and in the most pleasant halls. 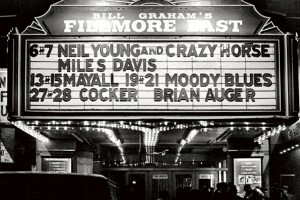 The list of performers who played at the Fillmore East is a “Who’s Who” of rock and roll greats. 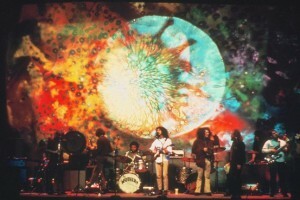 A very partial list includes: the Grateful Dead (39 shows over 28 dates); Jimi Hendrix’s Band of Gypsies; John Lennon and Yoko Ono who performed with Frank Zappa and the Mothers of Invention; the Allman Brothers (whose double-album Live at the Fillmore East is ranked 49th among Rolling Stone magazine’s “500 Greatest Albums of All Time”); Jefferson Airplane; Crosby, Stills, Nash, and Young; Joe Cocker; Miles Davis; Derek and the Dominoes; The Chambers Brothers; Mountain; Ten Years After; and Johnny Winter. An integral component of each performance, the Joshua Light Show provided a psychedelic art lighting backdrop behind bands. From the summer of 1970, Joe’s Lights, made up of former members of the Joshua Light Show, became the house light show, trading duties with The Pig Light Show until the venue’s closing.